Photographers are used to talking about or reading about pen-tablets – and they have their place – however I personally tend to see this largely as being when you need to do fine detailed work such as cleaning up skin or hair on studio shoots, or table-top product shoots. But for the most part I don’t need to go down to this level of detail – events being the most common example for myself. It may be because I’ve not totally got used to the tablet as yet (I have a Wacom Intuous 5 small). Before getting my tablet I’d customised my Photoshop so that my most used functions were assigned shortcut keys. I had to assign these in a couple of instances but Photoshop makes this easy as almost anything can be assigned a shortcut key. And on the whole – that’s it. There will be a few instances when I do other work but those are by far the most common. As I use layers a lot of these were shift-key combinations i.e. you had to press the shift key down and a letter key to operate the shortcut. These are the shortcut keys I set up, or were in place. Not a lot of thought was put into these initially but it’s what I got used to eventually. Although shortcut keys do certainly quicken the workflow (rather than selecting the item from Photoshop menus or sub-menus) it’s still a bit of a break in the flow – hands need to move, find keys, press them etc. This is especially so when the key-combination isn’t simple to do with one hand and both need to move (this is where I think I should have assigned simpler short-cut keys). So I had the idea of looking to find a mouse that has assignable buttons. Not sure now but I knew they existed – maybe just noticing one in a computer shop when doing something else. 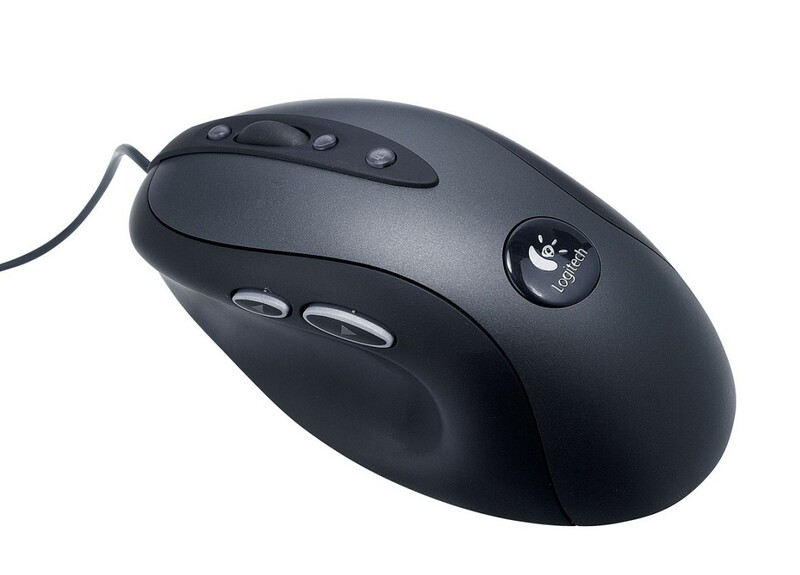 There’s a whole wealth of mice out there with more than the usual 2/3 mouse buttons – a huge amount in fact. They’re called gaming mice. Of course these are directed towards the gamers as they want to do certain actions quickly without swaping hand in case they get blown up ;)…… where’s that key to change weapon *BOOM* – damn game over…. and such like. They come in all shapes and sizes – some even have customizable shapes ! But their price range also vary significantly. 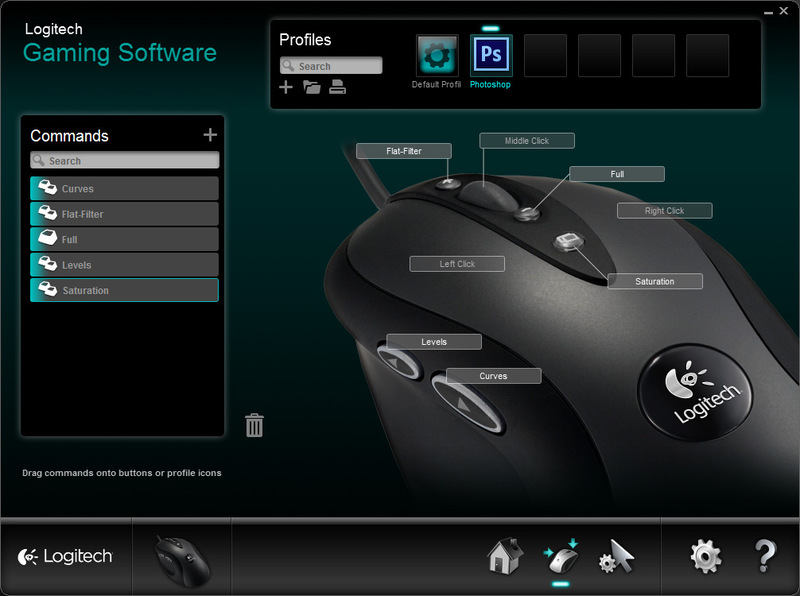 In the end (after looking at specs and reading reviews) I decided to go for the Logitech G400. I bought it for something like £25/27 (probably Amazon) rather than the £35 listed on the Logitech site. In addition to the usual 3 buttons (left, right, roller-with click) it has an additional 5 buttons. Two at the side that are assigned to anything and three at the top which are usually assigned to precision/speed. Each one refers to a “Multi Key” combination and one does two things (Flatten + Sharpen). You can do these using the tool/driver to record what you press – so it’s just a matter of clicking record and then doing the key presses. This also records lifting the keys after you’ve done. But one important thing to remember is that on the New layer combinations you also need to press Enter if you want to accept the default name of the window, which I usually do, else you’re left with the new layer prompt. If I want to rename it for a longer edit I can do that later. Rest is fairly simple really. 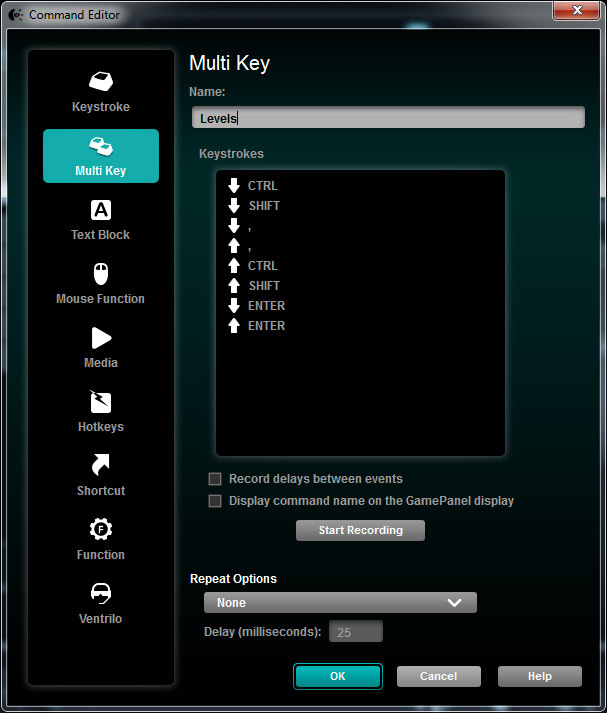 As seen in the first image you can set different button settings for different applications. It does come with some suggested configurations but almost all of these are games …. which I don’t have or have the time to play. Of late I have found that it can struggle to pick up which application I’m using sometime, especially when going from Bridge to CameraRaw and then to Photoshop. I’ll press a button to do something but instead of my assigned function something else will happen e.g. instead of maximising the image the mouse will get more sensitive (quicker). This can be solved by doing a windows alt-tab to swap away and then again back to Photoshop. Annoying sometimes but on the whole the mouse is saving me a lot of time. Very glad I bought it even though I now have a Wacom tablet too. This entry was posted on October 22, 2012 by Daf. It was filed under Gear, Ramblings and was tagged with bridge, Editing, keyboard, mouse, photoshop, shortcut keys, wacom tablet, workflow.